ROCHESTER, N.Y. – Semrock, Inc., the leading manufacturer of high-performance optical filters for the biotech and analytical instrumentation markets, today announced another innovative family of high-performance filter products made with advanced Ion Beam Sputtering. The new RazorEdge® Dichroic™ beamsplitters, which reflect a standard laser wavelength incident at 45 degrees while efficiently passing a broad band of the longer Raman-shifted wavelengths, boast an ultrasteep transition from reflection to transmission far superior to anything else on the open market. The guaranteed transition from laser line to passband in < 1% of the laser wavelength (regardless of polarization) makes these new filters a perfect match to Semrock's patented and popular normal-incidence RazorEdge ultrasteep long-wave-pass filters. 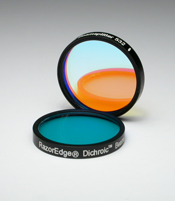 These new high performance RazorEdge 45-degree dichroic filters complement Semrock's unique family of 45-degree filters, including versions of its StopLine® notch filters, which reflect discrete laser lines incident at 45 degrees while passing both shorter and longer wavelengths (see 45° notch beamsplitters), and Semrock's equally unique family of MaxLine® laser-line filters which pass discrete laser lines incident at 45 degrees while reflecting both shorter and longer wavelengths (see 45° laser-line beamsplitters). "The popularity of our standard normal incidence RazorEdge filters has frequently prompted calls for a complementary 45-degree version, and we have responded with a state-of-the-art solution," said Dr. Turan Erdogan, CTO of Semrock. "Achieving this level of performance at 45 degrees is particularly difficult because of polarization splitting, but was realized as a result of our recent engineering advances. At Semrock we never stop innovating." These new dichroic products are available for standard laser wavelengths and generally ship from stock. All of Semrock's filters are made with dense, hard dielectric optical coatings for high laser damage threshold, low temperature sensitivity, and permanent performance, even in harsh, humid environments. About Semrock: Semrock manufactures, in high volume, optical filters that set the standard in performance and reliability for the biotech and analytical instrumentation markets. Semrock's patented and patent-pending products include the highly acclaimed BrightLine series of fluorescence filters for research and clinical microscopy, high-throughput screening, real-time PCR, and other fluorescence-based instrumentation; exceptional filters for Raman spectroscopy, and unique biomedical laser system optics. Semrock's innovative products are made possible by combining modern ion-beam sputtering with Semrock's proprietary volume manufacturing technology. Founded in September 2000, Semrock is based in Rochester, New York, a well-known center of optics, and has sales offices throughout the United States. BrightLine is a registered trademark of Semrock, Inc.